The atrocities of World War II are well known. We all know the stories of the Nazi camps in Germany, however few are aware this particular story occurred in America. After war is declared, countries often adopt policies to monitor enemy aliens within its borders to reduce the risk of domestic attacks. As national security is paramount to the president’s responsibilities, America is no exception. Nevertheless, the actions of Progressive Democrat President Franklin D. Roosevelt’s administration were only slightly better than Socialist Adolph Hitler’s Nazi practices. When Japan attacked Pearl Harbor on December 7, 1941, the perceived invulnerability of the United States in the minds of the American people was shattered. (see A Date Which Will Live In Infamy). Citizens were terrified as feelings of defenselessness swept over the country. While some were genuinely concerned for the country, many saw it as an opportunity to rid the nation of an undesirable race. Japanese began a mass migration to America during the late 1860’s in search of work. At first, they were welcomed as a preferred alternative to the Chinese. Yet, the original Naturalization Act of 1790 restricted naturalization to free white persons. This helped lead to wide discrimination against Asian immigrants, especially on the West Coast where they predominately settled. As part of the Gentlemen’s Agreement of 1907 between the U.S. and Japan, Japan agreed to deny passports to those wanting to come to America. In return, America would accept those Japanese already here. 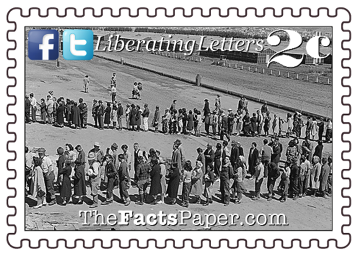 The Immigration Act of 1924 further defined America’s immigration standards. The number of accepted immigrants from mostly non-European countries was reduced while Asian immigration was banned completely. Those Japanese who were already here, known as Issei (“first generation”), were forever denied citizenship, which prevented them from owning land or voting in many states. However, any of their children born in America, or Nisei (“second generation”), by virtue of the 14th Amendment, were automatically citizens. (see America’s Voting Record). Therefore, any persons of Japanese ancestry in the country by World War II were here for decades. In fact, two-thirds were citizens by birth, so fears of loyalty to Japan seem greatly exaggerated. Anti-Japanese sentiment was already high before Pearl Harbor happened. In fact, Roosevelt began monitoring Japanese-Americans in Hawaii in 1936. Questionable individuals were placed on a list as the first to be arrested and placed in concentration camps if Japan struck America. Several reports insisted the Japanese-American community was loyal to America, finding absolutely no evidence of collusion with the Empire of Japan. Regardless, after December 7th some military leaders, like General John DeWitt, vigorously campaigned to intern any person with “one drop of Japanese blood,” claiming, “A Jap is a Jap. They are a dangerous element, whether loyal or not.” This included women, children, orphaned babies and even World War I veterans with Japanese ancestry. Once Pearl Harbor occurred, the U.S. government quietly started arresting Japanese-Americans within days. On February 19, 1942, Roosevelt signed Executive Order 9066, which commanded the forced evacuation of Japanese-Americans from the West Coast area, claiming military and national security concerns of espionage, spying, and sabotage. White farmers on the West Coast applauded Roosevelt, eager to dispose of the Japanese-American competition. Seventy-five years ago, the United States government sent out proclamations for Japanese-Americans to begin preparing to leave Washington, Oregon, California, and Arizona. Many of these legal aliens and citizens sold their homes, personal property, businesses, and inventories, usually at incredibly deflated prices, not knowing what the future would hold. Others left their property, believing they would soon return. The 1940 Census documented 127,000 persons in America claiming Japanese ancestry, with 80% living in California. Approximately 5,000 West Coast Japanese-Americans voluntarily left the excluded areas, moving to other parts of the country. Another 5,500 community leaders, including teachers, religious leaders and the like, were already arrested. After the allotted time, those remaining on the West Coast were forcibly relocated by the government. They gathered their meager belongings, only allowed to take what they could carry, boarded buses, and left the only home they’ve ever known, in most cases forever. Conditions were better at the ten “concentration camps,” as termed by Roosevelt, but not by much, than the Nazi concentration camps in Germany. Families from southern California were sent to northern camps with just the clothes they could carry. Many spent the freezing winters in sandals and summer clothing. Some families were even separated. Regardless, they never gave up hope. Hawaii also had a large Japanese-American population, making up approximately one-third of the people. However, Hawaiians did not agree with a blanket internment. Instead, only around 1,500 suspicious Japanese-Americans, with legitimate concerns under normal wartime practices and laws under the Geneva Convention, were detained. Even those arrested on the mainland had rights and were given trials. The atrocities were committed against those with no suspicions, yet forcibly imprisoned with no charges and no trial. Joyce Nakamura Okazaki, who entered a camp at age 7, rejects the term “internment”. She believes the proper label is incarceration or imprisonment. In her eyes, “I was not an internee because I am a citizen. The definition of internment refers to enemy aliens in time of war.” In fact, over 60% of those imprisoned were American citizens. On the other hand, there were thousands of new immigrants from the wartime enemy countries of Germany and Italy that were not treated like the Japanese. While suspicious people were arrested, those just having German or Italian blood were not rounded up and interned as the Japanese-Americans were. The government argued the “relocation camps” were for security reasons, keeping Japanese-Americans away from key military bases. Yet, their actions say otherwise. The Santa Fe, New Mexico, camp was located where the military was conducting the Manhattan Project. Not a logical move if you are trying to keep the internees away from military secrets. After the European Theater conflict ended in the spring of 1945, the concentration camps started closing. Japanese-Americans were allowed to leave, but most had nothing to go back to. If they hadn’t sold their homes or businesses, they discovered they were taken by seizure or foreclosure. Towns on the West Coast displayed signs informing the internees they were not welcome back. So, as is Japanese tradition, the families moved on, settling in other parts of the country, without complaint. Even after V-J Day on September 2nd, it still took until March 1946 before the last of the camps was closed. Many argue Roosevelt used the same questionable decision-making techniques against the Jewish German refugees trying to enter America in 1939, years before we were even at war with Germany. (see Voyage of the Damned). As a result of the report, redress bill H.R. 442, named for the decorated Japanese-American regiment, was presented to the new 1985 Congress. Republicans bulked at the bill, due to the increase in revenue. However, the Civil Liberties Act of 1988, otherwise known as the Japanese American Redress Bill, passed and President Ronald Reagan signed it on August 10, 1988. Acknowledging “a grave injustice was done,” the act instructed Congress to pay $20,000 in reparations to each surviving internee. An estimated 73,000 received restitutions between 1990 and 1998, along with a signed apology from the President of the United States on behalf of the American people. Liberty, national security is a constitutional obligation of the President of the United States. During times of conflict and war, decisions about detaining individuals has to be examined. It is why the character and integrity of the commander-in-chief is so important. Because of the injustice against Japanese-Americans, many are leery of any sort of ban or apprehension of persons due to race, religion, or nationality. It is very important that decisions are not made hastily. However, it is also not wise to dismiss any such actions at all. Earlier this year, Representative Mark Takano (D-California), responded to President Donald Trump’s travel ban, stating, “How you react to the Muslim ban today is how you would have reacted to the imprisonment of my grandparents and parents 75 years ago.” I can appreciate his apprehension. However, the two are not the same. Trump did not ban Muslims, rather he put a temporary hold on travel from specific countries in efforts to make sure proper background checkers were made so no terrorists were entering. It was identical to a ban President Barack Obama did during his administration, yet no one complained then. Also, Trump was not banning Americans, nor was he detaining anyone. He was only prohibiting the entry of non-Americans into the country. After experiencing several terrorist attacks on American soil, this is a reasonable action for a president. Criticizing it simply for political posturing only puts American citizens in danger. At least Takano has knowledge of the Japanese-American concentration camps. Many arguing against Trump’s Executive Order charge racism and authoritarianism, with no idea their favorite progressive president did it first and did it much worse. Liberty, I’ll state it again. This is why learning history is so important. If we don’t, we are doomed to repeat it.